"The annual steeplechase races are the high point in the social calendar of the horse-mad Virginians of cozy Crozet. But when one of the jockeys is found murdered in the main barn, Mary Minor "Harry" Haristeen finds herself in a desperate race of her own–to trap the killer. Luckily for her, she has an experienced ally; her sage tiger cat, Mrs. Murphy. Utilizing her feline genius to plumb the depths of human depravity, Mrs. Murphy finds herself on a trail that leads to the shocking truth behind the murder. But will her human companion catch on in time to beat the killer to the gruesome finish line?" Ugh! I’m here again, trying to write my thoughts on a Rita Mae Brown Mrs. Murphy book. I don’t say “ugh” in a negative way–especially not concerning the book. I say “ugh” because it gets harder and harder to come up with something to say about the books. Because, like many on-going series, you're either in on the bewitchery or you're not. 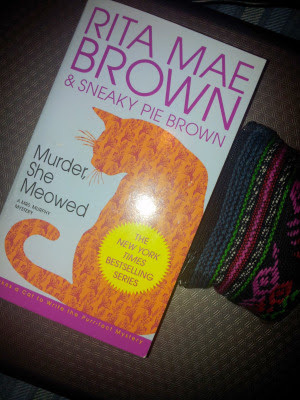 And considering Murder, She Meowed is book five, I'm in. They're stories revolving around a cat and a dog helping their human companion (they call her “mother”) solve cozy murder mysteries in small-town Crozet, Virginia. They're not the most astounding, intelligent, and thoroughly mind-bending mystery reads; but still they're simply great. What they are are fun, interesting, comfortable, and charming. Either you're lulled into the animalistic perspective of Murphy and Tucker, or you're not. Or maybe I like them because I love animals, but will pass at having pets. Regardless of all that, they have that something. I mentioned before how I love Brown’s “creamy” way with words. And how I love her drive in painting small-town citizens and their various nuances and dynamics with one another. Those components of her storytelling remains strong in Murder, She Meowed. (Actually, I was kind of baffled that the male model character wasn't around this time.) And yes, some of the mystery elements can sometimes come across as a little contrived. Then there’s the sometimes problematic situation of multiply players and perspectives biting into the mystery, meanwhile the trading of information between characters slips from my reading experience. In other words, sometimes I'm left trying to recall how such-in-such character gathered information privy to only those present at its delivery. Nonetheless, at the end of the day, it’s all about the character of Crozet and its cast, both human and animal alike. It’s that hook of the series that makes this happen. It's that hook that allows me to slip into a robe and just escape to Crozet as the sun goes down over my window. And arriving and finishing book number five only makes me squeal for the comfort, familiar and animal motivations inside book six.